Tortoises, especially giant ones accepted as diplomatic gifts, aren’t meant to give humans joy rides, or be spurred to do so with sharp objects. This is a fact that some Chinese tourists appear simply unaware of. Haicang Wildlife Zoo in Xiamen City, Fujian Province, is home to a pair of Aldabra giant tortoises—one of the largest species of tortoises in the world—that were given by Mauritius to the Xiamen government in April 2012. Upon receiving the tortoises, one male and one female, Zhan Cangzhou, a member of the municipal standing committee and Party secretary of the municipal Political and Legal Commission declared that “Xiamen will take good care of Mauritius’s national treasure,” according to a statement on the Xiamen government’s website. Three years later, Chinese netizens are calling Haicang Wildlife Zoo an “animal detention camp” after photos of the Aldabra giant tortoises started circulating online, Hong Kong-based online newspaper Oriental Net reports. 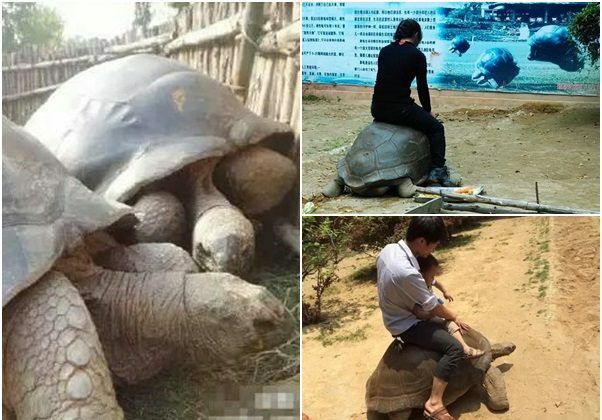 In the photos, a Chinese man, his son, and a girl are seen riding the giant tortoises. The boy and girl hold what appears to be a screwdriver, which they use to prod the tortoises to make them crawl. In another photo, one of the tortoise had tears in its eyes. The tortoises’ breeder, one Ms. Xue, told Oriental Net that she did allow tourists to snap pictures with the tortoises, since that was in line with the zoo’s regulations. Ms. Xue said she saw tourists mounting the giant tortoises and would caution them against riding them for too long. She has since lost her job at the zoo. Pet owners nationwide say Chinese-made jerky treats are still on sale and are killing their dogs. Tons of tainted pork products and waste oil products made from pigs that died of disease was discovered.